We can help you get the best deal for this product. By watching this product, we'll notify you when the price drops to your target price. It's free and easy. Sign In / Sign Up to start price tracking today! With the SanDisk Extreme 128GB(1) microSD UHS-I Memory Card get extreme speeds for fast transfer, app performance, and 4K UHD video. (2) Ideal for your Android smartphone, action cameras or drones, this high-performance microSD card handles 4K UHD video recording, Full HD video and high-resolution photos. The super-fast SanDisk Extreme microSDXC memory card reads up to 160MB/s* and writes up to 90MB/s. * Plus, it’s A2-rated, so you can get fast application performance for an exceptional smartphone experience. (7) | Not all devices support microSD memory card formats. Check with your device manufacturer for more details. | * For 128GB-400GB: Up to 160MB/s read speeds, engineered with proprietary technology to reach speeds beyond UHS-I 104MB/s, requires compatible devices capable of reaching such speeds. Up to 90MB/s write speeds. 1MB=1,000,000 bytes. | (1) 1GB=1,000,000,000 bytes. Actual user storage less. | (2) Compatible device required. Full HD (1920x1080) and 4K UHD (3840 x 2160) support may vary based upon host device, file attributes and other factors. | (3) Download and installation required. | (4) Card only. See SanDisk website for additional information and limitations. | (5) UHS Speed Class 3 (U3) designates a performance option designed to support real-time video recording with UHS-enabled host devices. Video Speed Class 30 (V30), sustained video capture rate of 30MB/s, designates a performance option designed to support real-time video recording with UHS-enabled host devices. | (6) Registration required; terms and conditions apply. | (7) For 64GB-400GB: A2 performance is 4000 read IOPS, 2000 write IOPS. Results may vary based on host device, app type and other factors. | (8) Read only; based on internal testing. Results may vary based on host device, file attributions and other factors. 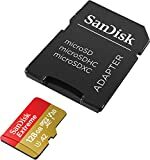 Interested in the SanDisk 128GB Extreme microSD UHS-I Card with Adapter - U3 A2 - SDSQXA1-128G-GN6MA? Is the price too high? You can easily price watch this product and we'll notify you when the price reaches your target. Registration is free and we'll do all the hard work, we promise. Prices are accurate as of date displayed and are subject to change without notice. Prices displayed on Amazon will apply to purchases.